Welcome to The Lifeboat Crew’s blog! The Lifeboat Crew is my intrepid band of LEGO minifigures. Our aim is to raise awareness of the valuable work done around our coasts by the Royal National Lifeboat Institution (RNLI) and its crews. 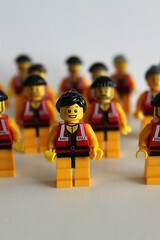 We’ll be bringing you stories, photos and important water safety messages – minifig style! My name is Simon Perks and ‘The Lifeboat Crew’ project is my way of helping the RNLI to save lives at sea. I’m a keen sailor, kayaker and gig rower and take great comfort from knowing that our lifeboat crews are there should I ever need them. In case you’re not familiar with the RNLI, it’s the charity that saves lives at sea. Its volunteer lifeboat crews rescue an average of 23 people every day and RNLI lifeguards provide a seasonal lifeguard service on many of our most popular beaches. The RNLI is independent from Government and relies on support from people like us. We hope you like what we’re doing and we’d love to hear from you. Simon (and the little guys). This entry was posted in News and tagged Lifeboats, RNLI, The Lifeboat Crew by Simon Perks. Bookmark the permalink. i am a LB crew where can i get some of the little guys ?